SOFIE IS A SPECIAL NEEDS PUP AND IS ADORED IN HER LONG-TERM FOSTER HOME! 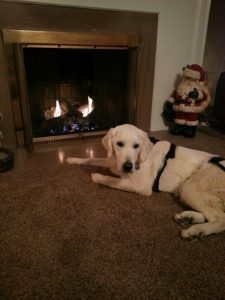 Sofie has been with her foster family for over a year, and while we have seen a lot of changes in her, it is apparent she will need a dedicated home to care and work with her every day. She had life saving surgery back in August of 2016 and is now able to sit up and walk a little. Hopefully you have seen many of the heartwarming videos and updates at our Facebook Group that her Foster Mom posts (also one video is posted below). Watching her determination is an inspiration to all. No question that Sofie has a zest for life and loves everything and everybody. Sofie couldn’t be happier that she was voted to become a Long Term Foster by the GoldHeart Board. Miss November 2017 (calendar), has gotten her wish, a forever family to love and adore her for years to come with the Schaefer’s including two loving fur-siblings, Sophie and Tucker. The Schaefer’s and her GoldHeart Family are committed to Sofie for the rest of her life and love her in spite of her medical issues. Fan mail for Sofie can be sent to her Foster Mom at president@goldheart.org. Donations to support her care and the Long Term Foster Program will be greatly appreciated. Please click on the donate button — Thank you! WHAT DOES IT MEAN TO HAVE A SPECIAL NEEDS ANIMAL? The reality is that all animals need special care and love. Special needs pets often require extra time and energy, especially as the pet gets older. 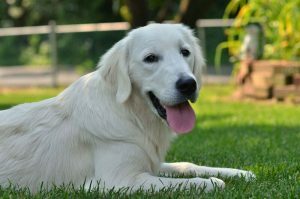 These animals take a certain commitment, both in terms of your time and financially, as they will typically need more ongoing veterinary care. However the rewards received, when caring for a special needs pet, are endless. Sofie is a champion bloodline English Cream Golden Retriever that was born in December of 2015. At about two weeks old, her give up family noticed that Sofie started to ro ll on her side. 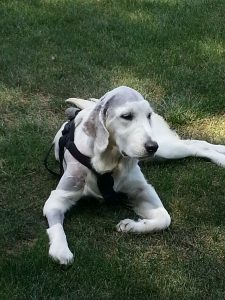 They immediately took her to the vet and found out she had an internal umbilical cord infection that had traveled to her brain, and advised she had Cerebellar Degeneration. Even with this news, her family hoped Sofie could have a happy life. Sofie has made significant progress since then. She is a very smart girl, and learns very fast. Sofie is still having problems with balancing/ coordination. She can stand on all legs but she falls over without leaning on something. Her give up family recently made a very tough decision to surrender Sofie to GoldHeart since work and time away from home was not allowing the family to give her the attention she deserves to get better. Sofie arrived on April 14, and is in a GoldHeart foster home where, over the coming months, she received all the attention she so deserves. Like her loving give-up family, we are staying positive and believe that Sofie will be able to walk without assistance and live a happy life. Sofie was spayed on July 14 and came through the surgery just fine. Sofie then had an MRI on August 9th. There is a cyst covering the cerebullum causing fluid on the brain. Without this expensive surgery she would eventually be in pain and will not progress any further than what she has. With surgery, she will not be in pain and there is a good chance she will walk on her own. The lifesaving surgery was performed August 24th, with shunt (drainage tube) placement from the brain to the stomach. Sofie is now recovering in her loving foster home. This picture was taken 4 days post operation, and she had to go in for more surgery after the shunt moved out of her tummy, so that was fixed, and she is doing much better now, and is on the path to recovery from the surgery. November 2016 – Video with her Foster Family and wait – watch for it – SHE IS UP ON HER OWN TAKING STEPS! Go Sofie!